In our Bible study on Sarah, we talked about the spiritual legacy that Sarah left for us as women of God. Here is Denise's response to this free lesson. I can not remember a time were I have blamed God, because I know and believe that things happen for a reason. I believe that God changed Sarai's name to Sarah,was that she was being called to a higher calling in her life. as was her husband. I was not surprised by her imperfections, because Sarah was human. I believe that the reason God does not gloss over peoples misstteps, was to show us that He can and will change us, that there is no limit for God. Also, to show us that, he still loves us and as his hands on us at all times. The one legacy, that i would like to leave for generations in my family, is that no matter how hard life and situations may become, We still need to pray and believe and know that God is there and that he has his hands on us and that all things are possible through him. Want to learn more about Sarah's journey from fear to faith? 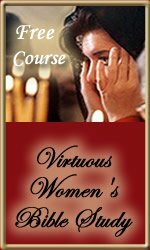 Read The Hem's free Virtuous Women of the Bible Study on Sarah. Perfection and pertinent living of the lives is made possible with the effects and impact of the best assignment writing companies studies. The skills and abilities are applied for the construction of the scripts and materials of the study.